1850, 17,034; 1800, 43,417; 1870, 92,829, of whom 38,815 were foreign born and 1,294 colored. Of the foreigners 15,856 were natives of Germany, 9,964 of Ireland, 4,008 of England, 2,634 of British America, 2,155 of Austria (proper), and 786 of Bohemia. There were 3,562 persons over 10 years of age who could not read, and 4,575 who could not write, of whom 3,748 were foreign. There were 16,182 families, with an average of 5.32 persons to a family. The population is now (1873) estimated at more than 150,000. The city received its first impetus from the completion in 1834 of the Ohio canal, which connects Lake Erie at this point with the Ohio river at Portsmouth. A further stimulus was given after 1850 by the development of the railroad system, and since 1860 its prosperity has been increased by the rapid extension of manufacturing industry. The greater portion of the city is built on a gravelly plain, elevated from 60 to 100 ft., and overlooking the lake. The river passes through it in a winding course, dividing it into two parts, and affords several miles of dock front. The harbor has been improved by the dredging out of a commodious ship channel, which branches from the river near its mouth, and by the erection of two piers, 200 ft. apart, stretching several hundred feet into the lake. On the E. pier is a lighthouse, and another stands on the cliff above. - Cleveland is laid out with much taste, chiefly in squares. The principal streets are from 80 to 120 ft. wide, Superior street having a width of 132 ft., and are lighted with gas and well paved. The abundance of shade trees, chiefly maple, has given to it the title of the "Forest City." The business blocks are mostly of brick and stone, from three to five stories high, and a large proportion of the dwellings are of the same materials. Euclid avenue is lined with elegant residences, each surrounded by ample grounds, and is considered the handsomest street in the country. Prospect street, parallel to the avenue, ranks next in beauty. River and Merwin streets, on the E. bank of the Cuyahoga, are occupied by the produce and shipping houses, and by many of the wholesale grocery stores. The jobbing business is principally in Water street, while Superior street is occupied by the larger retail stores, the banks, and the bookstores. The retail grocery, provision, and fruit stores are situated mostly in Ontario street, S. of the public square. This square, known as Monumental park, which occupies 10 acres near the centre of the city, was formerly open to foot passengers only, but since 1866 it has been divided into four smaller squares by the extension of Superior street from E. to W. and of Ontario street from N. to S. The square is shaded with trees, and is carefully kept. In the N. W. corner there is a handsome fountain; in the S. W., a pool and cascade; in the centre stands a statue of Commodore Perry, the hero of the battle of Lake Erie, erected in 1860 at a cost of $8,000. The pedestal is of Rhode Island granite 12 ft. high; the statue itself is of Italian marble, and is 8 ft. 2 in. high. In front of the pedestal is a marble medallion, representing the passage of Perry in a small boat from the Lawrence to the Niagara during the battle. West of the river is another park, called the Circle, which has a fountain in the centre, and is finely adorned with shade trees. The city cemetery is on Erie street; it is laid out with rectangular walks, shaded with trees, and contains many tasteful monuments. Woodlawn cemetery, more recently opened, is on the E. boundary of the city. It is prettily laid out, with paths winding among the native trees, and is rich in monuments and statuary. 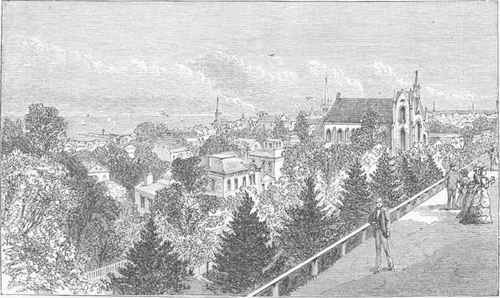 Lake View cemetery, containing 300 acres, 250 ft. above the level of the lake, was opened in 1870, on Euclid avenue, about 5 m. from the city. There is also a Roman Catholic cemetery, and a fifth on the W. side of the city. The water works stand near the lake, W. of the river, and to Jan. 1, 1870, had cost 8708.243 52, By means of a tunnel 5 ft. 2 in. high and 5 ft. wide, extending G,600 ft. under the lake, pure water is obtained, which is forced by two powerful engines into a large reservoir, occupying the highest point W. of the river, whence it is distributed through the city. The United States building, containing the custom house, post office, and federal courts, the county court house, and the city hall are fine buildings of stone. Case hall, a beautiful edifice near the park, built in 1866, contains, besides the rooms of the Cleveland library association, a hall capable of seating 1,500 persons. The house of correction, on the E. border of the city, is a large and splendid building. The Cleveland medical college occupies an imposing structure on the corner of Erie and St. Clair streets. The city infirmary is five stories high, and cost $25,000. The union railway depot, a massive stone structure, built in 1866, is one of the largest buildings of the kind in the world. The two high school buildings are handsome edifices of brick and stone, and several of the churches are noteworthy structures. Several bridges cross the Cuyahoga, connecting the different portions of the city, and there are seven street railroad companies. - The steam railroads terminating at or passing through Cleveland are as follows: the Lake Shore and Michigan Southern; Cleveland, Columbus, Cincinnati, and Indianapolis; Atlantic and Great Western (Mahoning division); Cleveland and Pittsburgh; and Cleveland, Mt. Vernon, and Delaware. These roads and the canal connect the city with the coal fields and grain districts of the state, and the oil region of Pennsylvania, while several lines of steamboats run to the various lake ports. The trade in anthracite coal amounts to about 10,000 tons per annum. The foreign trade is exclusively with Canada. The imports for the year ending June 30, 1872, amounted to $584,-576; the exports were valued at $893,172. There were entered from foreign countries 312 American vessels, of 86,753 tons, and 252 foreign vessels, of 46,479 tons; cleared for foreign ports, 274 American vessels, of 52,693 tons, and 269 foreign vessels, of 47,316 tons; entered in the coastwise trade, 599 steamers, of 395,174 tons, and 2,289 sailing vessels, of 450,501 tons; cleared, 590 steamers, of 396,618 tons, and 2,333 sailing vessels, of 467,234 tons. The total number of vessels cleared in 1863 was 3,109, with an aggregate tonnage of 1,112,696; in 1872, 3,466, with an aggregate tonnage of 963,861. In the latter year there were registered, enrolled, and licensed at this port 446 vessels, of 66,013 tons, including 181 sailing vessels of 40,076 tons, 60 steamers of 15,294 tons, 201 canal boats of 10,173 tons, and four barges of 469 tons. There were built during the year 5 sailing vessels of 2,229 tons, and 2 steamers of 1,598 tons. - The manufactures, particularly of iron and coal oil, are very important.
" nails and spikes, cut, etc..
" " stoves, heaters, etc. Tin. copper, and sheet-iron ware. Cleveland contains 6 national banks, with an aggregate capital of $4,800,000, 2 savings banks, and 9 insurance companies (2 life), with a capital of $1,950,000. There are 31 hotels and 3 markets. - The city is divided into 17 wards, and is governed by a mayor and common council of two members from each ward. There are also a clerk, who is likewise clerk of the common council, an auditor, a treasurer, a solicitor, a street commissioner, a civil engineer, and a superintendent of markets. The board of improvements consists of the mayor, street commissioner, engineer, a clerk, and two other members; the board of health is composed of the mayor, health officer, and six others. The United States circuit and district courts for the northern district of Ohio are held here; also the state district court, the court of common pleas, a probate and a police court. The board of metropolitan police consists of the mayor, a secretary, and a superintendent. The city is divided into 5 precincts, and the force, besides the privates, is composed of a captain, 6 sergeants, 3 acting sergeants, 3 detectives, and 3 special detectives. The fire department is under the control of a chief engineer and 2 assistants. There are 7 steam engines, 2 hook and ladder companies, and a fire alarm telegraph, under the charge of a superintendent. The assessed value of property in 1870 was $51,841,746. - There are several well conducted reformatory and charitable institutions. The house of correction is under the charge of a board of directors. The city infirmary, to which the sick and homeless poor are taken, has attached to it a good farm, which is worked by the inmates of the institution. Connected with the infirmary is a house of refuge for children, where they are instructed and taken care of until of an age to maintain themselves. St. Vincent's male orphan asylum contains 150 orphans under the charge of the sisters of charity, and St. Mary's female orphan asylum, under the charge of the ladies of the Sacred Heart of Mary, has 160 inmates. The "little sisters of the poor" provide for 70 aged men and women. The Cleveland orphan asylum is supported by voluntary contributions, and by an endowment fund of about $54,000. The Episcopalians have a home for sick and friendless widows, and the Jews support an orphan asylum. A United States marine hospital has been established here, and is situated on the border of the lake. The charity hospital, established partly by the city and partly by subscriptions, is attended by the sisters of charity. There are also a homoeopathic hospital and a city hospital. In the industrial school poor and homeless children are provided with food and shelter, and are taught the common branches of education, sewing, domestic labor, and brush making. The public schools are under the control of a superintendent and a board of education of one member from each ward, and consist of 2 high schools and 16 grammar and primary schools. The average attendance of pupils in 1871 was 8,175, of whom 4,133 were males and 4,042 females, the number of teachers was 187, of whom 9 were males; the receipts were $145,049 67 from taxation, and $48,457 69 from the state fund; expenditures, $143,700 95, of which $118,655 were for teachers' wages and $27,880 69 for sites and buildings. The Cleveland female seminary had 13 instructors, 100 pupils, and a library of 1,000 volumes; the Union business college had 6 teachers and 448 pupils. There are two German and English schools, 7 other seminaries and schools belonging to Protestant societies, 11 Roman Catholic academies and schools, and 6 private and select schools. The Ohio State and Union law college, founded in 1856, in 1871 had 2 professors, 28 students, and a library of 2,500 volumes. The Cleveland medical college (medical department of the university of Wooster), organized in 1843, had 14 instructors and 101 students; while the homoeopathic hospital college, founded in 1849, which admits female students, had 17 professors, 86 students, and a library of 2,000 volumes. St. Mary's ecclesiastical seminary (Roman Catholic) has 3 professors and 25 students. The Western Reserve historical society has its seat here. The Cleveland library association have a reading room and a library of 12,000 or 15,000 volumes. The public library, opened in 18G9, contains about 8,500 volumes. There are 6 daily newspapers (1 German), 3 tri-weekly, 1 semi-weekly (German), 10 weekly (2 German and 1 Bohemian), and 1 semi-monthly and 7 monthly periodicals. The principal place for dramatic entertainments is the academy of music, besides which there are a Bohemian theatre, a German theatre, a theatre comique, and various other public halls for lectures, etc. The freemasons have 2 halls and 13 lodges, chapters, etc, of which 1 is for Germans; the odd fellows have a hall, 2 encampments, and 10 lodges (2 German). There are 10 temperance societies, and 25 lodges, etc, of other orders. The city contains 88 churches, divided as follows: 7 Baptist (1 German and 1 colored), 1 Bible Christian, 13 Roman Catholic (1 Bohemian, 1 French, and 4 German), 1 Christian, 5 Congregational (1 colored), 1 Disciples', 2 Evangelical (German), 4 Evangelical Association (3 German), 2 Evangelical Lutheran (German), 2 Evangelical Protestant (1 German), 1 Free Will Baptist, 1 Friends', 2 Jewish, 15 Methodist (2 German and 1 colored), 7 Presbyterian, 11 Episcopal, 4 Reformed (3 German), 1 Spiritualist, 1 Swedenborgian, 1 LFnitarian, 3 United Evangelical (1 German), 1 United Brethren (German), 1 Universalist, and 1 miscellaneous. There are a young men's Christian association, a women's Christian association, 2 convents, and 2 other Catholic relitrious associations. - Cleveland was laid out in 1796, and was named in honor of Gen. Moses Cleaveland, a native of Connecticut, under whose charge the first surveys in what is known as the Western Reserve were made. It was until 180G confined to the E. shore of the Cuyahoga, and was an important strategic point in the war of 1812. A portion of what is now the city of Cleveland was incorporated as a village in 1814. A city charter was granted in 183G.